I frequently receive emails from readers who are looking for more information about a particular grape that they've come across that I haven't had an opportunity to write about yet. A few months ago, several different readers started asking me about an Italian grape called Rebo, which at the time I had not heard of before. One of the people inquiring was just starting to import wine into Ontario, Canada, under the name Don Emilio Brands, and a wine made from the Rebo grape was going to be his first import. It took some creativity, but I was able to get a bottle of Rebo from him, and I'd like to tell you a little more about the grape and the wine made from it. Rebo was created in 1948 by an Italian agricultural geneticist named Rebo Rigatti at the San Michele all'Adige research center in Trentino. Rigatti lived from 1891 until 1971, which made him a contemporary of Luigi Manzoni, creator of many Italian crossings such as Manzoni Bianco. Manzoni was certainly a more prolific breeder and his crossings are definitely more widespread today than Rigatti's, as evidenced by the fact that Rebo, Rigatti's most well-known crossing, is planted on less than 100 acres in Italy today, as opposed to 24,000 acres for Manzoni Bianco. Many sources (such as Wine Grapes) indicate that Rigatti initially listed Rebo's parentage as Merlot x Marzemino, but that DNA evidence has recently shown that it is in fact a Merlot x Teroldego crossing. Lacombe et al. (citation 1), in their massive study which analyzed several thousand grape varieties to test for synonymies and parental relationships, confirmed that the correct parentage is Merlot x Teroldego, but they list it as confirmation of the breeder's data, which suggests that Rigatti had the parentage recorded correctly all along. I do not have access to Rigatti's papers or published reports so I'm not sure what he actually said, but I don't suppose it matters much since the actual parentage has been confirmed several times at this point. Most of the Rebo grown in Italy is in the province of Trentino, where Rebo Rigatti lived and worked. Wine Grapes claims that varietal wines from Rebo are grown only in the Trentino DOC, but I think what they mean is that the Trentino DOC is the only DOC or DOCG area in Italy that allows for varietal Rebo wines. Today's wine, the 2009 Pratello "Nero per Sempre," is from the Benaco Bresciano IGT region, which is around the western shore of Lake Garda in Lombardy. Nero per Sempre means something like "black forever" in Italian, but I'm not exactly sure what that's supposed to mean in this context. This wine is made from 100% Rebo grapes that are dried in wooden boxes with forced ventilation for 30 days. The partially dried grapes are then pressed and the juice is poured into stainless steel tanks for fermentation. 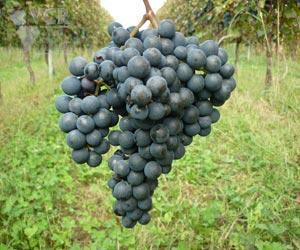 The process is very similar to the production of Amarone, but the drying time for Amarone grapes is much longer. Pratello also makes a regular table wine from non-dried grapes that is 95% Rebo and 5% Barbera, but I wasn't able to try that particular wine. As mentioned above, the Nero per Sempre was sent to me as a sample bottle (online store here), and I'm not sure what retail on the bottle would be, though the importer told me it might be around $30 in Ontario. As usual, I have not received any compensation for this review other than the bottle itself and what follows is my honest appraisal of the wine. In the glass the wine was a deep, nearly opaque purple-ruby color. The nose was fairly intense with delicious, fruity aromas of black cherry, blackberry jam, cocoa powder and dried cherries. On the palate the wine was full bodied with fairly high acidity and soft medium tannins. There were flavors of blac cherry, dried tart cherry, blackberry jam, bittersweet chocolate and espresso. The wine clocks in at 15% alcohol and really shows it, as I found it very hot and a little clumsy. It is an absolute whale of a wine, though, with huge, pure fruit flavors. It doesn't have the depth and complexity of fine Amarone, but it also doesn't carry the whopping price tag either and if it's really only around $30, it's a very nice value for those looking for the Amarone experience on a budget. It's such a powerful wine that I have trouble thinking of foods it might complement, and I find myself thinking that it's probably at its best after a meal, maybe with a little bit of cheese. 1) Lacombe, T., Boursiquot, J.M., Laucou, V., Di Vecchi-Staraz, M., Peros, J.P., & This, P. 2012. Large scale parentage analysis in an extended set of grapevine cultivars (Vitis vinifera L.). Theoretical and Applied Genetics, 126(2), pp 401-414. What are we talking about when we talk about Malvasia? This can be a frustrating question to answer, and many of the sources we would turn to in order to help us understand Malvasia actually aren't much help at all. Most sources, like Oz Clarke's Grapes and Wines and Wikipedia, consider Malvasia as a family of grapes or, even worse, as a series of "sub-varieties" that all basically roll up into a single thing called "Malvasia." Before we go too much farther, I would like to take this opportunity to implore you, if you have ever used the phrase "sub-variety" to describe a grape, to please discontinue this practice and strike these words from your vocabulary. Properly speaking, there really isn't any such thing as a sub-variety. 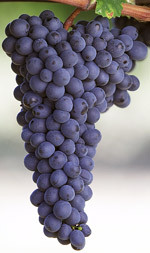 There are grape varieties and there are clonal variants of these varieties, but there is no such thing as a sub-variety. Much of the confusion over sub-varieties comes, I think, from grape "families" like Malvasia, Trebbiano or Lambrusco, where there are a handful of different grapes that all have the same first word in their names, but different second words. The easy conclusion to jump to is that these are all basically the same grape, and they are just different enough to require a second word to differentiate them from one another, but are basically so similar that we are best served by thinking of them as a single group. This is absolutely not the case, and today I'd like to start a new series on this blog called Know Your Malvasia, where I'll be taking a look at different Malvasia-named grapes to see what we're really talking about when we talk about a particular Malvasia. The series will stretch out into Know Your Lambrusco and Know Your Trebbiano as well, so stayed tuned for that. Malvasia is perhaps the most difficult grape to get a good handle on because while there are definitely named varieties of Malvasia that some wine drinkers are familiar with (such as Malvasia Nera or Malvasia Fina), for the most part, when you come across a wine made from the Malvasia grape, you are only ever given the word "Malvasia" to go on. The most commonly planted Malvasia in Italy is Malvasia Bianca di Candia, which can be found virtually everywhere throughout the country. 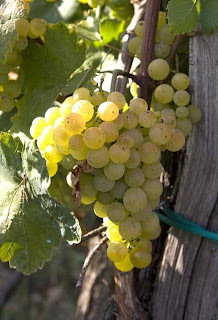 To make matters worse, though, there are specific varieties of Malvasia that can be found in specific regions of Italy, and these varieties aren't always differentiated from Malvasia Candia. In Tuscany, you've got with Malvasia Bianca Lunga while in Lazio, you're usually dealing with Malvazia del Lazio (for white wines, anyway). Malvazia del Lazio is actually related to the Muscat family of grapes (literally, as it is an offspring of Muscat of Alexandria), but Malvazia Bianca Lunga is more closely related to other Malvasias like Malvasia Nera di Brindisi, Malvasia di Lipari and Malvazija Istarska, though all of these are separate varieties and are in no way "sub-varieties" of any grape. Worst of all, Malvasia Bianca di Candia doesn't seem to be related to any of the other Malvasia varieties, including Malvasia di Candia Aromatica, but rather has a parent-offspring relationship with Garganega, of all things! Once you get all of the above straightened out, you still have to deal with the rest of the world, since there are a handful of Malvasia-named grapes grapes in Slovenia and Croatia as well as a few in France and Spain as well. Portugal probably comes in second in the race for Malvasia confusion, as they have Malvasia Fina (which we learned is actually the Boal grape from Madeira), Malvasia de Colares, and Malvasia Preta, none of which are related to one another or to the other Malvasia-named wines in other parts of the world. The most well-known Malvasia-named wine in Portugal, though, is actually not generally known as Malvasia at all. Rather it is known as Malmsey, and it is the sweetest of the four noble Madeira styles (which are, from driest to sweetest, Sercial, Boal, Verdelho and Malmsey). Virtually every Madeira source that I've read simply indicates that Malmsey is made from Malvasia grapes, but as I hope we've seen by now, that's really not a very useful distinction. After all, Boal is technically also made from Malvasia grapes, since one of Boal's synonyms is Malvasia Fina. What are we talking about when we talk about Malmsey Madeira? The answer is, as you might expect, a little complicated. In the 15th Century, Malvasia Cândida (which is not the same as Malvasia Bianca di Canida or Malvasia di Candia Aromatico), which is in fact the same as the Malvasia di Lipari grown in Sicily (which we'll examine in a few weeks), was introduced to the island of Madeira and for many centuries, this was the grape used to produce the wines labeled as Malmsey. For reasons that are not entirely clear to me, Malvasia Cândida declined in popularity through the years and today there are only about 10 acres of it left on the island of Madeira. In the 1970's, a new grape called Malvasia Branca de São Jorge was introduced to the island. This grape was created by José Leão Ferreira de Almeida at an agricultural research station near Lisbon from two unknown parents and was first cultivated in the parish of São Jorge on the northern coast of Madeira. There are about 86 acres of Malvasia Branca de São Jorge currently planted on Madeira and it is now the dominant grape used for production of wines labeled as Malmsey. So, as a general rule of thumb, wines labeled Malmsey from prior to 1970 or so are probably mostly Malvasia Cândida, while wines made after 1970 are probably Malvasia Branca de São Jorge. Which brings us to today's wine, which is the NV Rare Wine Company New York Malmsey ($40). I can't say for sure what grape or grapes were used to create this, but my best guess is that it's probably mostly Malvasia Branca de São Jorge. In the glass the wine was a fairly dark tawny-brown color. The nose was fairly intense with aromas of burnt sugar, raisins, caramel, prunes and smoke. On the palate the wine was medium bodied with fairly high acidity. It was very sweet with flavors of smoky scorched sugar, prunes, raisins, toasted nuts and a touch of fresh green apple. The alcohol was pretty noticeable in this wine, much more so than in the other three Madeira styles I tried from this producer (Sercial, Boal, Verdelho), which made the wine a bit more awkward than some of the others. It was a very nice wine, but it was probably my least favorite of this series of wines mostly because I just felt like it wasn't quite as well balanced as some of the others. I'd be curious to try an older vintage version alongside a newer vintage to see what kind of difference the change in grape variety makes. The recently published Wine Grapes, which I reviewed here, advertises itself as "a complete guide to 1,368 vine varieties," which is really an astonishingly high number of grapes. I've covered just over 200 on this blog and probably have another few hundred in me, but 1,368 represents a staggering amount of work, and even though I definitely have some issues with the book, I really admire and respect Jancis Robinson and her team for all the work that obviously went into the finished product. That being said, one of the first things that I did when I finally got my hands on my copy of the book was go through it to see whether the were any grapes that I had tried that the authors may have overlooked. I didn't find very many, but one that I did find was a grape I discovered when I placed an order with Arbor Hill Winery (who also made the dry Moore's Diamond I wrote about recently) in New York State called Vergennes. I had never heard of Vergennes before seeing it on Arbor Hill's website, so I quickly ordered it and have recently had an opportunity to try it. Vergennes is thought to have originated as a chance seedling (which just means that a vine was naturally pollinated in the field and one of the resulting seeds was planted) in the garden of a William Green in Vergennes, Vermont in 1874. According to the VIVC database, one of the parents was a grape called Dracut Amber, but since the vine was naturally pollinated, the other parent is currently unknown. Arbor Hill's website claims that the grape has vinifera parentage, but most other sources seem to disagree. In the 1908 work The Grapes of New York (viewable here), U.P. Hedrick considers Vergennes to be a pure Vitis labrusca variety (and the VIVC agrees), and says: "The variety is somewhat remarkable in being probably the best shipper and the best keeper among the pure Labrusca varieties. Nearly all of the grapes which ship and keep well have more or less Vinifera blood, but if Vergennes has any foreign blood it shows it only in its keeping and shipping qualities." 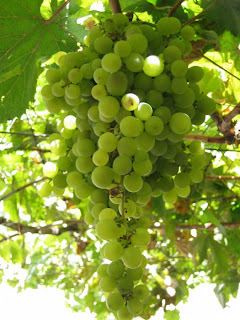 Hedrick describes the vine as a reliable cropper that can be prone to excessive yields, which can affect ripening times if left unchecked (excessive crops can delay ripening by up to two weeks). He also says that Vergennes wasn't very popular with growers because the vine had a tendency to sprawl, or grow wild and resist training, which made it difficult to work with in the vineyard. It is fairly cold hardy, but is also somewhat susceptible to diseases like anthracnose. "Flavor not rich, but pleasant, free from hard pulp; ripening a little after Concord and possessing superior keeping qualities. As a winter grape it probably heads the list. This variety proves generally satisfactory, in some localities very desirable. General Wm. H. Noble gives the following recommendation to the Vergennes: 'for hardiness, vigor of growth, large bounteous fruitage, a fruit of richest tint of blended pink and purple bloom; for its yield of wine with the most delicate aroma; for its early maturity of wood and fruit; for its long-keeping quality, I think this the equal of any American grape.' While this is excessive praise, which we would not indorse (sic), the Vergennes is no doubt well worthy of attention. It has so far 'held its own,' and increased in popularity." If you scan through any of these old catalogs or books on American viticulture from the early 20th Century, you'll come across a lot of entries for grapes that have more or less disappeared from cultivation over the past hundred years. Vergennes likely would have joined the ranks of many of those vines if not for John Brahm of Arbor Hill Winery. John graduated from Cornell in 1964 with a degree in Pomology and worked for Widmer Wine Cellars in Naples, New York for over 20 years. He and his wife founded Arbor Hill in 1987 and they decided to plant some "experimental" grape varieties to see how they fared. They are credited with being the first winery to produce a wine made from the Traminette grape, and are also credited with "re-introducing" the Vergennes variety as well. I bought a bottle of the 2010 Arbor Hill Vergennes for $10.50 from the winery. I spent a little time on Google to see if I could find another Vergennes-based wine and came up blank, so this may very well be the only one in the world right now. 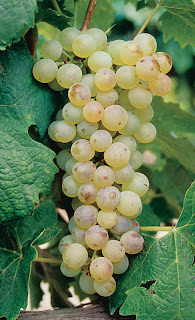 Though the skins of the grape are pink, this is a white wine and in the glass it was a fairly light silvery lemon color. The nose was moderately intense with aromas of pear, green melon and a subtle but unmistakable note of foxy, musky grapiness. On the palate the wine was on the lighter side of medium with high acidity and touch of sweetness. There were flavors of pear and grape musk with something a little steely and minerally on the finish. If you've ever tasted a slip-skin grape like a Scuppernong and kept the skin in your mouth for awhile after you've eaten the pulp, you'd have a really good idea of what this wine tasted like. It had all the musk and flavor of a wild grape, but it lacked the sugary kick that you expect to go along with those flavors and aromas. Much like the dry Moore's Diamond from this same producer, I found this wine a bit disconcerting, odd and not really all that pleasant to drink. While I applaud the spirit of experimentation that would lead one to make dry or mostly dry wines from native American grape varieties, I'm beginning to feel like the results are showing why so many producers make sweet wines from these grapes. Some flavors just need some sugar, and these wild, musky grape flavors certainly fall into that category for me. In the very early days of this blog, I went through a few of the wine books that I had and tried to put together a grape "wish list." The first list had about two dozen grapes on it and I sent it around to a few of the wines shops that I frequented to see if they had any of them in stock or to see if they could possibly order some of them for me. The Terrano grape was on that list, and I'm happy to say that not only were my wine shop friends able to help me track that particular grape down, but also every other grape that I could come up with at that time. I don't really keep a list any more these days (though I do have a kind of unofficial list in my head of things that I'm always on the lookout for) but I do still hang on to that first one so I can see just how much ground we've covered here in only a few years time. Which brings us to today's grape, Terrano. Terrano has been around for a very long time, with the first mention of it actually coming all the way back in 1340 AD. These old references mention both a white and a red-berried Terrano, but the white-berried form seems to have been lost to history. The very earliest mentions of Terrano in print are to plantings in modern day Slovenia, where it is currently known as Refošk. Slovenia is the world leader for plantings of Terrano with a couple thousand hectares under vine around the city of Trieste, which is actually in the region of Friuli in Italy, but it's in that weird little finger of Italy in the extreme northeast that is practically surrounded by the nation of Slovenia (see map). Most Slovenian plantings are just north and south of the city of Trieste, and many of the Italian plantings can be found around Trieste as well (there were only about 200 hectares of Terrano in Italy as of 2000). If you go south from Trieste and through the narrow band of Slovenia into the Istrian peninsula of Croatia, you will find more plantings of Terrano, as Croatia has nearly 500 hectares of Terrano (known here as Teran) under vine. There is a particular kind of soil called Terra Rossa, or "red earth," in this little corner of the world and it is said that Terrano reaches its greatest heights only when grown on this terra rossa soil. When dirt turns red, it is usually because of high iron content, and according to Wikipedia, wines made from Terrano are unusually high in iron. Wikipedia's source is a link to this page, which says that Terrano's unique flavor is actually due to the iron (bivalent iron, whatever that means) reacting to lactic acid in the finished wine, and, further, that wines made from Terrano tend to deteriorate quickly because the iron levels drop rapidly within a year or two of fermentation and this special chemical bond dissipates. There are no sources cited and I haven't found any evidence elsewhere to support these claims, so caveat emptor etc (though if commenter WineKnurd is reading, I'd be very interested to hear his take in the comments below). Terrano belongs to something called the Refoschi Family, whose name is a bit misleading since many of the grapes in this family aren't actually related to one another. Like the word Trebbiano or Malvasia, over the years the word Refosco has been used to describe a number of different grape varieties grown in and around this little area where Italy, Slovenia and Croatia meet. The most common Refosco grape is Refosco dal Peduncolo Rosso, which we covered here some time ago. There is also Refosco di Faedis, Refosco d'Istria (which is the same as Terrano), Refosco di Guarnieri, Refosco del Botton (which is the same as Tazzalenghe) and Refosco Gentile. Of these grapes, only Refosco del Botton, Refosco Gentile and Refosco di Faedis seem to have any genetic relationship to one another (the former two seem to have a parent-offspring relationship with the third). While the others do share many ampelographic traits, to the extent that Terrano and Refosco dal Peduncolo Rosso were long thought to be the same variety, the DNA evidence seems to show that they are actually distinct varieties*. Interestingly, the grape known as Cagnina in Emilia-Romagna (where it is made into sweet red wines) is the same grape as Terrano, and this is one of the very few places outside of Friuli/Slovenia/Croatia where this grape can be found. I was able to try two different wines made from the Terrano grape. The first was the 2009 Tenuta Amalia "Mamertino," which I picked up from my friends at the Spirited Gourmet for around $12. I don't know very much about this wine since the bottle just says "Product of Italy" and "Italian Frizzante Red Wine." The importer's website says it is 100% Terrano, but I have no idea where the grapes are from. The back labeling almost seemed to be saying that the grapes come from Italy, but the wine itself may be made, or at least bottled, here in the US. In any case, the wine was a medium purple ruby color in the glass. The nose was reserved with aromas of black cherry, blackberry and grape soda. On the palate the wine was medium bodied with medium acidity. It was also sweet with just a touch of fizziness to it. There were flavors of grape Kool-aid, black cherry and grape soda. The finish was astoundingly short and really tasted more like soda or juice than wine. I don't really know what this is or what it's supposed to be, but I don't think I'm a fan of it. I figured there had to be more to Terrano than this, so when I found a bottle of the 2011 Catelvecchio Terrano from the Carso region of Friuli, I snapped it up ($20 from Vintages in Concord, MA). As I mentioned above, I had read that Terrano-based wines are really not meant for ageing, so I figured I'd give a newer vintage a shot. In the glass the wine was an inky purple black color with a bright purple rim. The nose was moderately intense with aromas of smoke, sour cherry, cranberry, wet leather, blackberry and black cherry. On the palate the wine was on the lighter side of medium with very high acidity and medium tannins. It was sour with flavors of tart cherry, cranberry, under-ripe blackberry and leather. It was bright and zippy, but also almost painfully sour to drink and really demanded some high acid, tomato-saucy kind of food. It was miles better than the Mamertino, but still wasn't something that I think I'll find myself reaching for very often. *This is according to Jose Vouillamoz's private research reported in Wine Grapes, which you can read all about here to decide how big a grain of salt is required. I've covered some pretty rare grapes on this site over the past three years or so, but today's grape is definitely the scarcest one that I've ever written about. I would guess that prior to today, my post on Amigne probably would have taken the prize for rarest grape, as it is planted on less than 50 hectares of land in the world, and nearly all of them are in a single valley in Switzerland. It's possible that something like Tempranillo Blanco may be planted on less land, but I haven't been able to find any planting statistics that would say for sure. Today's grape, though, is grown on a scant 6 hectares of land, which only comes to around 15 acres. To put it another way, 15 acres is 0.023 square miles (0.060 square km for those of you on the metric system). When I was growing up in Georgia (the US state, not the country), my family lived just outside of a very small town on about 13 acres of land. You could stand anywhere in the yard and see every other part of it with little trouble and if you wanted to run a lap around it, it would probably take you about 10 minutes at a good jog. Six hectares is practically nothing. But it's not absolutely nothing, and the wine made from the grapes grown on those scant six acres of land does occasionally find its way to our shores. Before we get to the wine, though, I'd like to take a few moments to take a closer look at the Biancu Gentile grape itself. References to Biancu Gentile can be traced back to 1822, when the grape was said to be growing in Pila Canale in the southern part of the island of Corsica. It is thought to be native to Corsica and examples of Biancu Gentile have not been discovered anywhere outside of the island (though UC Davis does have a small experimental plot growing in the San Joaquin Valley in California). The grape's name means something like "noble white," but the word gentile can also mean something like "grafted," or, "cultivated," as opposed to "wild." Biancu Gentile is prized for its aromatic profile and can reach very high sugar levels, but the acidity begins to drop precipitously as the sugars rise so growers must be especially vigilant in order to pick grapes that can make balanced rather than heavy, flabby wines. The grape was thought to be extinct when Yves Leccia, whose varietal Biancu Gentile we'll be taking a look at below, discovered a small block of it growing somewhere on the island of Corsica. He took some cuttings and began to cultivate it in his own vineyards. Since Biancu Gentile was supposed to be extinct, it was not permitted in the AOC wines of Corsica and so anyone making a varietal wine from it had to resort to the vin de table classification level for their wines. As of 2010, Biancu Gentile is allowed in the new IGP classification (which is basically the new EU-wide term for what used to be called vin de pays in France or IGT in Italy), so wines made from it can have the grape name listed on the bottle (this is forbidden at the vin de table level, as is vintage information or specific geographic information). Biancu Gentile is often blended with the local variety of Vermentino, but a handful of producers such as Yves Lecchia, Antoine Arena and Yves Canarelli of Clos Canarelli make varietal wines from their scant plantings (around 1 ha each) of the grape. I was able to find a bottle of the 2011 Yves Leccia Biancu Gentile as a special order from my friends at the Wine Bottega for around $40. All of Yves Leccia's white wines are pressed and cold soaked for 24 hours before allowing fermentation to begin. Fermentation (2-3 weeks) and maturation (6 months) is done in temperature controlled stainless steel and there is no malolactic fermentation. In the glass the wine was a medium lemon gold color. The nose was moderately intense with aromas of ripe pear, lime, grapefruit, honeysuckle flower, lemon peel and chalk. On the palate the wine was medium bodied with medium to medium + acidity. There were flavors of lime, grapefruit, pear, and honeysuckle with a bit of chalky minerality on the finish. The nose was an absolutely delightful citrus fruit cocktail, but the intensity and just general loveliness didn't really follow through that much on the palate. The price tag on this wine is pretty steep for what you're getting, but then again, with only 6 hectares under cultivation, you may not get many chances to try a Biancu Gentile based wine. Today's grape is a German crossing just like so many other German crossings that I've written about time and time again (see, for example, my posts on Huxelrebe, Dornfelder, Scheurebe and Kerner). The grape's name is Domina (which means "lady") and it was created in 1927 at the German research institute of Geilwilerhof by two men named Bernhard Husfeld and Peter Morio. They crossed Pinot Noir and Blauer Portuguesier to create a high-yielding grape with very good disease resistance. The vine is so productive that bunch-thinning is required to avoid thin, dilute wines from over cropping. 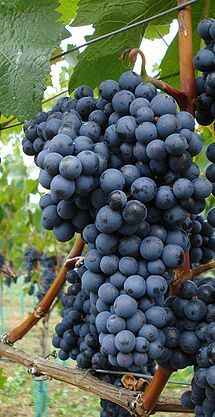 The berries are fairly small, and as a result, the finished wines tend to be very deeply colored, which is interesting since neither Pinot Noir nor Blauer Portuguesier are particularly well known for producing deeply colored wines. The grape is grown on about 400 hectares of land in Germany (just under 1000 acres), most of which (350 hectares) is in Franken (just east of Frankfurt in southeastern Germany) and the Ahr (just west of Bonn). There are apparently also about 1000 square yards under wine in Switzerland, but I'm not aware of any other plantings in any other countries. An unbelievable number of grapes grown commercially in Germany are, like Domina, crossings made at these research institutions, and if you're curious as to why that may be the case, I invite you to peruse any of the articles linked above, as I feel like I've discussed it ad nauseum. Instead, I'd like to talk a little bit about the bottle that this wine was sold in, the bocksbeutel. Wikipedia calls the shape of the bocksbeutel a "flattened ellipsoid," but it really just kind of looks like a flask to me. I've seen and tried many German wines in this particular kind of bottle, but I always assumed it was some kind of gimmicky packaging used to catch the eye of a consumer. I didn't realize that the EU considers it a "protected bottle shape," which is something I didn't even know existed, but apparently that means that the actual shape of the bottle itself must conform to certain measurements, and also that only certain wines from certain areas are allowed to use it. According to Wikipedia, the bottle specifications state that a bocksbeutel must be "a short-necked glass bottle, pot-bellied but flattened in shape, with the base and the cross-section of the bottle at the point of greatest convexity ellipsoidal in shape. The ratio between the long and short axes of the ellipsoidal cross-section is approximately 2:1, and the ratio of the height of the convex body to the cylindrical neck of the bottle is approximately 2.5:1." - Certain Portuguese wines. The use is limited to rosé wines and those other quality wines and vinho regional which can prove that they have traditionally been bottled in cantil-type bottles before they received their present classification. 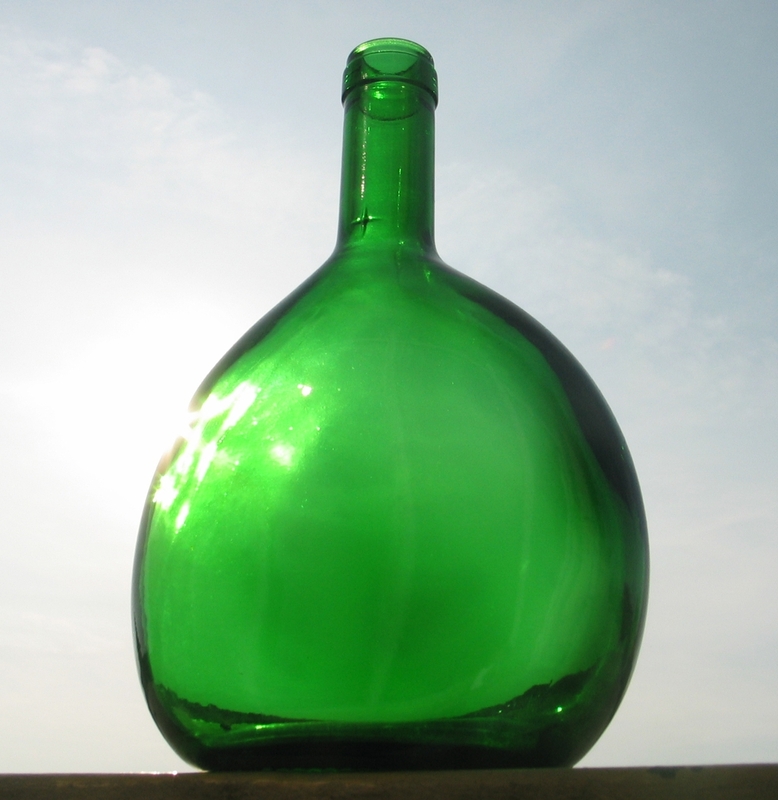 The bottle's history can be traced back several hundred years. In his The Wines of Germany, Stephen Brook notes that the bocksbeutel shape appears in some German artwork of the 16th Century and that glass versions have been manufactured in Germany since at least 1685. In 1726, the Prince-Bishop of Würzberg declared that the best wines from that city be bottled in the bocksbeutel, and its wider use followed shortly after. There is no agreement on the origin of the name, but there are at least two major theories. The first is that it comes from the word Booksbüdel, which was the name for a small sack used to carry books, like prayer books or song books, in the 15th and 16th Centuries. The other explanation is that name means "ram's scrotum," because the shape of the bottle apparently resembles the scrotum of a ram. I do a lot of fact checking for this blog, but that's something I'm just going to take someone else's word on. The wine that I was able to try was the 2009 Winzer Sommerach Domina from the Franken region of Germany, which I picked up from my friends at the Spirited Gourmet for around $25 (I believe it is also currently available from the fine folks at Curtis Liquors for around the same price). In the glass the wine was a fairly dark purple-ruby color. The nose was somewhat reserved with aromas of black cherry, blackberry, old leather, cedar and char. On the palate the wine was on the fuller side of medium with medium acidity and low, soft tannins. There were flavors of smoky, scorched black cherry and sour cherry, blackberry, cedar and cranberry. There was an intriguing mixture of dark black fruits and tart red fruits, but the palate was mostly dominated by a kind of bitter smokiness. It wasn't as pronounced (or as unpalatable) as the burnt rubber that pretty much ruined the Blauer Portuguesier that I tried, but it still was a bit unwelcome for me. It was a nice wine, but probably a bit over priced for what you get. I've taken some heat for not being a big fan of German red wines, and this bottle clearly isn't the one to show me the light. 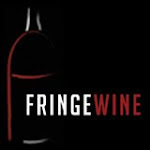 Several years ago, when I first started writing this blog, I came across the website for the Blue Danube Wine company, which is an importer located in California that specializes in eastern European wines. I looked through their online catalog and found an incredible number of wines made from grapes that I had never heard of before and which I had little chance of finding in my local wine shops. I live in the state of Massachusetts, though, and it isn't legal for wineries, wine shops, distributors or importers to sell wine directly to me, so for the past couple of years, I've just had to admire Blue Danube's portfolio from afar and hope that I could someday try some of the interesting wines that they were working with. A few months ago, my dream came true as Blue Danube began to be distributed within Massachusetts by Arborway Imports. Arborway only carries a handful of Blue Danube's wines, but most importantly, they and Frank Dietrich (owner of Blue Danube) were willing to work with me and allow me to get my hands on several of Blue Danube's offerings in a totally legal fashion. Over the next few weeks and months, I'll be writing about many of these really cool wines that I've been able to try. The first wine I'd like to tell you about is made from the Žlahtina grape. Žlahtina is a Croatian grape that is found on the island of Krk just off the coast of Dalmatia in northwestern Croatia (see this map for more details). Krk is the largest of the more than 1000 islands in Croatia and most of the vineyards on the island are located inland, away from the coast, in order to avoid the "Bura," the strong wind that blows throughout the region of Dalmatia. Krk was once well known for the wines it produced and at one time, the island was covered with over 25,000 hectares (nearly 62,000 acres) of vines. Today, however, there are fewer than 250 hectares left, over 95% of which are devoted to the Žlahtina grape. The grape's name comes from the the Croatian word "Žlahtno," which means noble and gives some indication as to how highly regarded the grape was in the past. Most sources agree that Žlahtina is likely native to the island of Krk, as it is found pretty much nowhere else in the country (or outside the country, for that matter). There are some naming issues with Žlahtina that can cause confusion with other grape varieties. There is a grape grown in Slovenia called Rdeča Žlahtnina, or "pink Žlahtnina," and according to the crew at Wine Grapes, the genetic profile given for Rdeča Žlahtnina in a recent paper (citation 1) matches that of the Chasselas grape from Switzerland. I checked the profile for Chasselas in the VIVC database, and it looks like they do match. The Wine Grapes crew also say that Žlahtina is an accepted synonym for Chasselas in the VIVC database (and therefore that many believe that Žlahtina and Chasselas are actually the same grape), but it looks like they weren't reading carefully enough. There is a Žlahtina Bigela, a Žlahtnina, and a Žlatina listed as synonyms for Chasselas, but no Žlahtina. Furthermore, the DNA profile given for Žlahtina in this 1999 paper is definitely distinct from that of Chasselas/Rdeča Žlahtnina, showing that this is definitely a distinct grape variety. While I did order several wines from Blue Danube, Frank was kind enough to also send me a few samples and the bottle under review here was one of those sample bottles. It is the 2011 Šipun Estate Žlahtina, which retails for about $17 on the Blue Danube website. The vineyards and winery are located on the eastern part of the island of Krk, around the city of Vrbnik. The wine is fermented in stainless steel and then 60% is kept in tank while 40% is aged in a mixture of acacia, oak, mulberry and chestnut woods. In the glass the wine was a fairly light silvery lemon color. The nose was moderately intense with aromas of pear, white flowers, green melon, golden apple and chalk. On the palate the wine was medium bodied with fairly high acidity. There were flavors of Lemon, pear, white flowers, pineapple and green apple with a strong, stony and chalky kind of minerality on the finish. It was tart and racy, but also delicate and soft at the same time. It was dominated by lemon citrus and mineral flavors, but it had a little flesh with some white pear fruit as well. Ivica Dobincic, a Croatian vigneron, praises the Žlahtina grape for its difficulty in accumulating sugars, even in very hot years, which means that these wines are often modest in alcohol (this one was 12.4%) and delicately flavored. It's a light, delicious little wine that was really a pleasure to drink. Štajner, N, et al. 2008. Microsatellite genotyping of old Slovenian grapevine varieties (Vitis vinifera L.) of the Primorje (coastal) winegrowing region. Vitis, 47(4), pp 201-4. Hello everyone and welcome to another edition of Odds and Ends, where I write about interesting wines that I've tried lately which I don't think merit a full post on their own. All of the wines I'll be writing about today are made from grapes that I've already written extensively about in the past and those relevant links will be included in each write-up. Additionally, all of the wines I'll be looking at today are imported by my good friend Paul Turina, whose new and improved company website can be perused here. I profiled Paul and his company about a year ago (read here) and have since tried a handful of wines from various producers that he imports. All of the wines I'll be writing about below were provided to me as samples by Paul, but all opinions expressed are entirely my own and I have received no compensation for any of the reviews below other than the wines themselves. About a month after I first met Paul, I was introducing him to some people in the Boston area to try and get his wines distributed here (he is still looking for a Massachusetts distributor, so if anyone is interested, please email him). One of the wines he poured at a meeting that I accompanied him to was this sparkling pink wine made by some distant relatives of his around Lake Garda in Italy. I wasn't able to get a note written on the wine (unlike the sparkling Turbiana he also brought which I wrote about here), but I remember enjoying it quite a bit. I asked him a few weeks ago if he still had any around and he said he had a few bottles from a recent shipment. He handed the bottle off to me the next time he was in town and I promptly popped the cork on it. It's a non-vintage, tank-fermented sparkling wine that is made from about 50% Groppello and 50% Marzemino and retail on the bottle (from Paul's website) is about $17. In the glass the wine was a medium salmon pink color with fine steady bubbles. The nose was fairly intense with aromas of fresh cut strawberry, red cherry, watermelon and pink bubblegum. On the palate the wine was on the lighter side of medium with fairly high acidity. It was dry and tasted like cut watermelon and strawberries with a touch of red cherry. It finished with a clean, almost quinine-like bitterness. It's a fun wine, but it's well structured enough to be serious as well. I drank it around Valentine's Day and it's the perfect wine for that occasion. His distant Italian relatives not only make wines from Groppello and Turbiana, but also from the Marzemino grape, which I wrote about around a year and a half ago. Paul recently let me try his family's 2009 Marzemino from the Brescia region of Lombardy on the western shore of Lake Garda. In the glass the wine was a medium purple ruby color. The nose was moderately intense with aromas of sour cherry, blackberry, cocoa powder and leather. On the palate the wine was on the lighter side of medium with high acid and fairly soft tannins. There were flavors of tart cherry, blackberry, old dusty leather, black plum and cocoa powder. It was a little lean, but it made up for it with a nice, bright, racy streak of acidity. As I said in my previous post, Marzemino seems like a grape tailor-made for tomato sauces and pizza. I had this wine with a big plate of spaghetti and it was a near perfect match. While I'm not as fond of Marzemino in general as Don Giovanni was, I do like it in the right circumstances and this is a very well made example. Paul imports wine from a number of different regions in Italy and from a number of different producers. I've taken a look at some of his producers making wines from Vespaiola, Grechetto and Sagrantino in the past, but today I'd like to take a look at a couple of wines from a producer he works with in Friuli called Petrussa. Petrussa is located in the Colli Orientali del Friuli region of northeastern Italy and they deal with many of the grapes that are common to that region. One of them is Friulano, which we took a look at about a year ago. This particular bottling is from the 2009 vintage. In the glass the wine was a medium lemon gold color. The nose was fairly reserved with aromas of white pear, lilac and eucalyptus. On the palate the wine was on the fuller side of medium with fairly low acidity and a kind of oily mouthfeel. There were flavors of eucalyptus, pear and lime with a kind of stewed vegetable quality that I find in many of the wines made from the Friulano grape. This is a well-made wine, but it's a grape that I just can't fall in love with. The next wine from Petrussa that I tried was made from the Schioppettino grape, which I did like quite a bit when I was able to try it before. This particular wine was from the 2008 vintage and in the glass it was a medium purple ruby color. The nose was moderately intense with aromas of black cherry, plum, fresh turned earth, damp leaves and leather. On the palate the wine was medium bodied with high acidity and soft tannins. There were flavors of tart cherry, blackberry, old leather and wet leaves. Right after the cork was pulled, the wine was searingly, almost abrasively sour but it does round out a bit as it settles into the glass. It's bright and zippy the whole time, though, so fans of high-acid red wines probably need not apply here. The bright, tart fruits are really well balanced by the damp earthy flavors and the wine reminds me a bit of an electrified Pinot Noir. It needs food and it needs high acid food so anything with tomato sauce would go quite nicely here.